The market is expanding as the technology continues to develop, according to industry insiders. Spectroscopy allows us to analyze the world around us on an ever-smaller scale and with ever-better resolution. BioPhotonics recently spoke with a few leaders in the industry – Eric Bergles, vice president of sales and marketing at BaySpec Inc. in San Jose, Calif.; Robert Chimenti, marketing manager at B&W Tek in Newark, Del. ; Dr. Charles Keith Manka, a consultant for Research Support Instruments (RSI) in Lanham, Md. ; and Uwe Ortmann, head of sales and marketing at PicoQuant GmbH in Berlin – to get a taste of what the market is like now and where it will go in the near future. Q: How would you say the market has been in the past few years for spectroscopy lasers? Bergles: The market for Raman instruments has been growing at 10 to 20 percent per year recently, with the fastest-growing area out-of-lab handheld and portable instruments and ruggedized in-line process control instruments. Initial demand came from the homeland security and defense applications, with more recent vertical markets established for pharmaceuticals, forensics, gemology/minerals, petrochemical, plastics recycling, food safety, among others. Chimenti: Molecular spectroscopy requires the most number of lasers out of any other segment of spectroscopy, and it has been growing consistently year over year for the past several years. As a result, the market for lasers in biospectroscopy has remained strong, despite broader economic conditions. Ortmann: It’s been expanding both in number and in specifications. Today you can get low-cost diode lasers starting from 375 nm. Also, the UV range is not a problem anymore. Sources have become of better quality, easier to use and more versatile. Manka: Ours are one of a kind and are significant capital purchases, and thus [they are] purchased only occasionally. Q: Where is the market going? Manka: Trend is downward for price, and this will eventually make this technology accessible to more interested research groups. Chimenti: According to recent reports from Strategic Directions International and other industry analysts, the growth rate of the molecular spectroscopy market as a whole is expected to slow down. However, with the recent emergence of novel diagnostic and screening methods based around Raman and fluorescence spectroscopy, these particular segments are expected to outpace the growth in the overall molecular spectroscopy market. As a result, we should expect to see continued growth in demand for the type of compact, high-quality laser systems and modules used in fluorescence and Raman instrumentation. Bergles: Although there is a clear trend toward miniaturization, there are always trade-offs to consider. In the end, we see clear requirements for multiwavelength Raman microscope systems, high-resolution in-line systems performing real-time analysis in process control environments, portables for mobile labs as well as continued use of easy-to-operate handhelds. Each will have its own niche. Ortmann: It will be a steady and organic growth. A spectral plot of a porcine kidney, captured using the Nomadic Raman microscope. Courtesy of BaySpec. Q: And which application areas would you say are thriving – and why? Manka: Interest in detection and identification of biologicals and chemicals is still intense in fields that extend from forensics to defense to medicine. Bergles: Synthetic biology, renewable bioenergy, systems biology – all these areas that require in vivo or in-line spectroscopic techniques. Traditional biochemical methods just haven’t been able to keep up with the needs of these applications, and people in these areas have really latched onto the benefits of spectroscopy and made it flourish. Chimenti: I feel that applications in biomedical diagnostics based on Raman spectroscopy are showing the most potential to significantly thrive in the years to come. The reason being that Raman spectroscopy is highly selective, which allows it to identify and differentiate molecules and chemical species that are very similar. As a result, Raman spectroscopy provides an invaluable analytical tool for molecular fingerprinting as well as monitoring changes in molecular structure. When these features are combined with not only incredible enhancement factors provided through surface enhancement techniques, but also its intrinsic insensitivity to aqueous absorption bands (that other vibrational spectroscopies are plagued by), Raman is proving to be the ideal choice for highly selective biomedical diagnostics. Ortmann: We consider ourselves as the market leader in high-quality timing systems (laser, TCSPC [time-correlated single-photon counting]). We offer single-molecule-sensitive systems; this was the ultimate challenge. Now [that] we have already established this for almost a decade, it’s time for bringing single-molecule spectroscopy to the next level. That would be the real-world [applications] like sensing and everyday analysis. 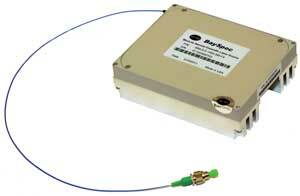 BaySpec offers the Mini-Lite narrowband Raman laser for spectroscopy applications. Courtesy of BaySpec. 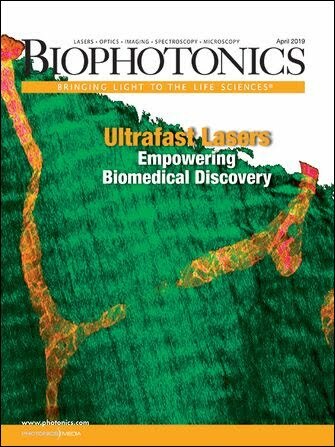 Q: What do you see as the “next big thing” in laser-based biospectroscopy? Chimenti: In my opinion, the next big thing will be increased applications of Raman spectroscopy in biomedical diagnostics. Raman spectroscopy is gaining widespread recognition in biomedical research as a principal diagnostic and screening tool, with one of the most active research areas being cancer detection. There are two particularly interesting examples that our customers are currently working on in this area. The first is breast cancer detection using highly portable Raman instrumentation with onboard chemometric analysis in the operating theater. The second is the development of a surface-enhanced Raman scattering (SERS)-based immunoassay array for pancreatic cancer marker screening. Manka: On the laser side: continuation of the rapid development of frequency agile (continuously tuned) deep-UV lasers. On the detection side: sophisticated analysis programs for rapid identification and rejection of false alarms. Ortmann: We expect that more companies [will] offer time-resolved spectroscopy in their product portfolio. This is extremely important for high-quality analysis [such as] DNA analysis, Alzheimer’s, ophthalmology, etcetera. We estimate that more and more systems in hospitals and research labs will be equipped with modern time-resolved spectroscopy. Bergles: Dispersive infrared Raman spectroscopy at 1064 nm and longer. Many biological samples autofluoresce, sometimes to the point that Raman signal extraction is impossible. 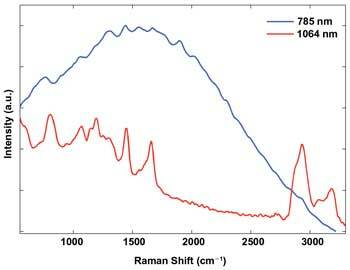 Traditionally, fluorescent-free Raman spectra have only been possible by FT [Fourier transform]-Raman systems, which are slow, cumbersome and require sample preparation. Plus, the physics of FT instruments prevent them from being used confocally, which is a huge interest in biological work. Now, the infrared lasers and InGaAs detectors BaySpec helped mature in the telecommunications world are being applied to our spectral instruments. These dispersive infrared Raman systems are used in the same way as any shorter wavelength dispersive systems, but avoid the fluorescence and can finally allow true confocal operation. Q: Are you seeing any new and exciting scientific imaging advances coming out of R&D and/or university labs? Ortmann: Various, actually. Now, more and more details of DNA and protein interaction are revealed. This will lead to more and more assays and fast tests on the molecular level. Bergles: Technology advances in recent years are pushing in vivo spectroscopy and imaging into single-molecule level, without any labeling – remember, traditional single-molecule detection has always required fluorescent labels. Several examples are surface-enhanced Raman, tip-enhanced Raman and nanoparticles. Nonlinear Raman techniques are also quite exciting, such as CARS [coherent anti-Stokes Raman scattering] and SRS [stimulated Raman scattering]. They are still being refined in the labs but could make an enormous impact once they are more mature. Manka: Steady advances in pulse frequency, duty cycle, power, tuning and reliability. Perhaps you would say this is a maturing capability. Chimenti: B&W Tek isn’t heavily involved with scientific imaging in the traditional sense, but we are seeing interest in using highly synchronous multipoint spectral sampling in order to construct hyperspectral images of various biological samples, which is difficult to do using conventional spectral imaging technologies. To monitor kinetic changes in these samples, it is necessary to utilize a system of spectrometers that provide a high degree of synchronization and are able to collect data at a high speed without any downtime between measurements. 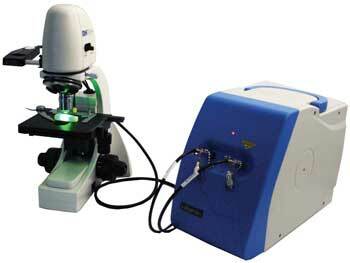 The i-Raman from B&W Tek weighs less than 7 lb and offers high resolution and field portability. Courtesy of B&W Tek. Q: What are the biggest challenges to new advances in spectroscopy lasers for biological applications? Chimenti: There are two major challenges that are hindering new advances. The first challenge is in producing a wider range of wavelengths which will enable the development of fluorescence-based instrumentation with a higher degree of selectivity. The other, and more important, challenge is to create smaller, less expensive lasers that consume less power while still maintaining the same level of performance. Ideally, every medical and emergency response professional would have a handheld Raman spectrometer and/or fluorimeter that performs instantaneous diagnostics anywhere, but at this point, the technology is simply price-prohibitive. Bergles: Speed. For high-resolution spectroscopy and microscopy, the system has to respond quickly to capture the dynamics happening in a biological system. But just as important, I think, is the lag in new adoption of technologies. Fluorescence techniques have been very slow to give way to Raman approaches, and a lot of Raman users are still using old systems and technology because that’s what they’ve got, and changing isn’t always cheap. That’s why we’re starting to make a bigger push to let people know what the newer technologies (like 1064-nm dispersive Raman) can offer, and so far we’ve gotten some very positive responses. Ortmann: To make the applications more user-friendly and also to find well-targeted assays and special-design medical spectrometers. The companies featured in this article make a wide range of products for spectroscopy, particularly as related to biology. BaySpec has several multiwavelength-excitation Raman product lines, from miniaturized systems to research-grade confocal microscopes. “Having multiple lasers integrated into one unit is important for biological samples because the biochemistry of each sample [responds] uniquely at different wavelengths,” Bergles said. BaySpec also offers lasers, detectors and related optical systems such as visible and near-infrared spectrographs for fluorescence and diffuse scattering spectroscopy, hyperspectral imagers, OCT engines and custom design work. B&W Tek produces diode and diode-pumped solid-state lasers used in many forms of spectroscopy related to biological research and diagnostics, especially fluorescence- and Raman-based applications, Chimenti said. Some of the company’s top products for Raman spectroscopy include its patented CleanLaze technology and miniature fiber optic spectrometers. PicoQuant designs pulsed, modulated and nanosecond lasers, mainly for fluorescence applications. The company’s pulsed lasers are especially popular for fluorescence lifetime applications, Ortmann said. PicoQuant also makes time-correlated photon-counting modules and detector modules as well as whole spectrometers and confocal microscopes for fluorescence lifetime imaging microscopy and fluorescence correlation spectroscopy. RSI, a subsidiary of Physical Sciences Inc., uses laser innovations to provide engineering support, development and specifications for applications including biological and chemical hazard detection and identification. Methods for identifying and mapping materials through spectroscopic remote sensing. Also called imaging spectroscopy; ultraspectral imaging.